Rarely does the humble pencil holder have such an impressive pedigree. Designed by letterpress stationery mastermind Tara Hogan of INK+WIT and made by Alan Dorsey, an artisan woodworker from Brooklyn, this bear-shaped pencil holder is made from solid reclaimed mahogany and will fit up to 8 pencils, colored pencils, pipe cleaners, or whatever else your kids might want to stick in it! We dig the simple, clean design so much it might end up on Mom or Dad’s desk until school goes back in session. Rarely does the humble pencil holder have such an impressive pedigree. 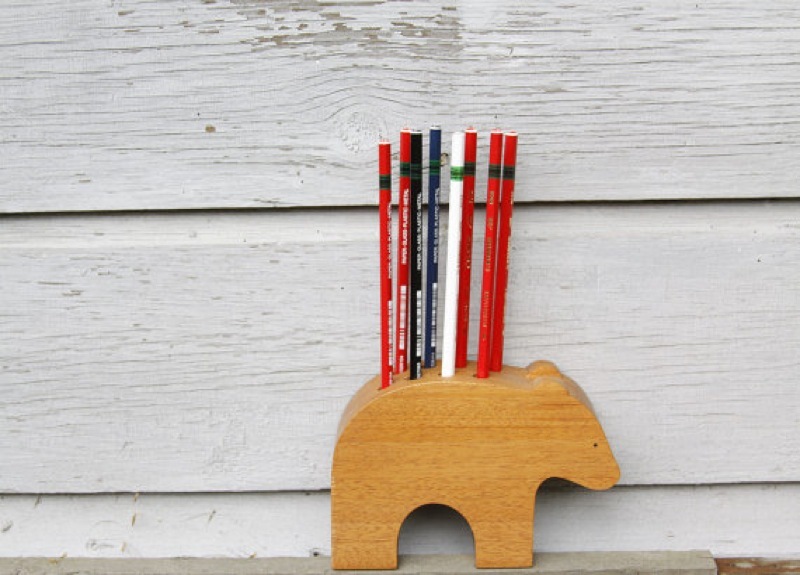 Designed by letterpress stationery mastermind Tara Hogan of INK+WIT and made by Alan Dorsey, an artisan woodworker from Brooklyn, this bear-shaped pencil holder is made from solid reclaimed mahogany and will fit up to 8 pencils, colored pencils, pipe cleaners, or whatever else your kids might want to stick in it! We dig the simple, clean design so much it might end up on Mom or Dad�s desk until school goes back in session.